Jackson Pollock’s Number 1A, 1948 painting was investigated using in situ scanning macro-x-ray fluorescence mapping (MA-XRF) to help characterize the artist’s materials and his creative process. A multivariate curve resolution-alternating least squares (MCR-ALS) approach was used to examine the hyperspectral data and obtain distribution maps and signature spectra for the paints he used. The composition of the paints was elucidated based on the chemical elements identified in the signature spectra and a tentative list of pigments, fillers and other additives is proposed for eleven different paints and for the canvas. 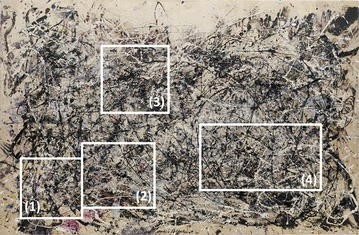 The paint distribution maps were used to virtually reconstruct the artist process and document the sequence and manner in which Pollock applied the different paints, using deliberate and specific gestures. Jackson Pollock painted Number 1A, 1948 at a transformative time in his career, when he abandoned the easel to ‘paint’ flat on the floor, gradually introducing the use of household enamel paints that he poured, dripped and splattered on canvas at an increasingly large scale. This is also one of the rare instances where he used his hands to stain and mark the raw canvas, perhaps to provide a compositional structure for the layers that followed. Black, purple and brick red handprints are seen on the four edges of the painting, but close examination suggests many more are partially hidden under successive layers of paints. 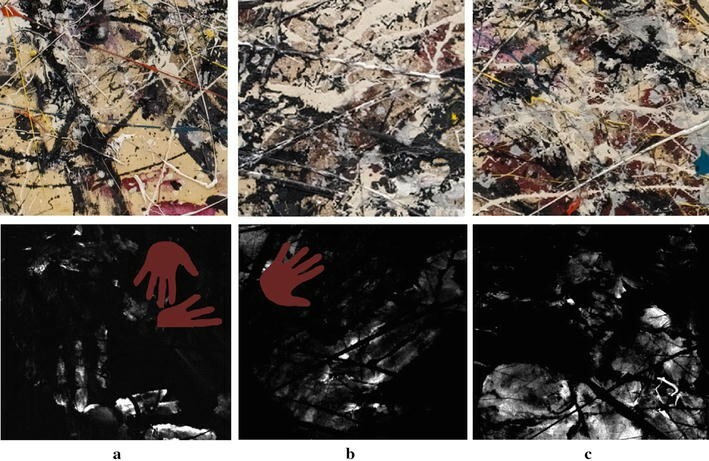 Macro X-ray fluorescence (MA-XRF) mapping was used to confirm and visualize some of these concealed handprints, and at the same time characterize the paints Pollock used in a noninvasive way. Few studies have been published on the materials used by this artist despite the wealth of publications on his artistic process. Analysis was done in the past to characterize the paints he used to execute some of his paintings in the 1940s and early 1950s [1–5] and the paint cans that have been preserved in his studio [3, 6]. These studies required sampling and the use of sophisticated and ultra-sensitive analytical methods to identify the paint media and pigments. Characterization of the inorganic paint ingredients, namely pigments, fillers, driers and other additives can also be done in a noninvasive way using in situ XRF analysis with a handheld instrument. However, the interpretation of the spectra can be particularly complex for layered and mixed paints and the technique actually provides information on the elements present and not directly of the compounds . This technique has recently become available in mapping mode at the macro scale and was used in a recent study on Pollock’s Mural  to characterize the materials in the painting in a noninvasive way and simultaneously map their distribution to reveal how Pollock applied them. Hyperspectral imaging techniques are finding widespread applications in the field of cultural heritage in particular for the study of paintings. Information on the nature and distribution of pigments and binders can be gained by using a range of mapping techniques operating in the visible and UV , mid-IR [9, 10] and near-IR  regions or based on Raman scattering , X-ray fluorescence (XRF) [13–16] or X-ray diffraction (XRD) . These techniques entail the acquisition or rendering of a spectrum for each point mapped on the surface of the object (one spectrum per pixel) followed by computer processing of the large data cube to generate maps with contrasts based on the varying signal intensity and thus abundance of the materials being targeted, generally chemical elements or compounds. In the case of MA-XRF mapping, the hyperspectral data cube is typically processed by fitting the XRF spectra to an analytical model to obtain elemental maps . This allows to simultaneously infer the nature of the inorganic pigments and fillers based on the elements identified in the spectra and examine their distribution over the painting’s surface and hidden layers. For historical paintings, this approach works relatively well as the chemical composition of the applied materials, the techniques and layer build-up are relatively well-known for specific artists, schools or periods. In modern and contemporary art, however, the diversity and lack of information on the pigments, fillers and other additives that have or can be used in the manufacturing of both artist and industrial paints, as well as the known complexity of modern paints formulations [19–21] render the interpretation based on elemental maps alone often painstaking and potentially misleading. In this paper, we aim to demonstrate the advantages of a multivariate curve resolution-alternating least squares (MCR-ALS) approach  to decompose the MA-XRF data cube into the contributions of paints instead of chemical elements. MCR-ALS is a statistical decomposition method that can resolve mixtures by determining the number of independent “pure components”, their response profiles, and their estimated concentrations, when no prior information is available about the nature and composition of these mixtures. When applied to multispectral and chemical imaging, MCR-ALS analysis assumes that the spectrum of each pixel can be decomposed into the contributions of a set of pure components and will proceed to extract both the signature spectrum and a measure of the concentration or relative abundance of each component. In the particular context of XRF-mapping of paintings, the pure components extracted with MCR-ALS can correspond to the different paints or paint ingredients used by the artist. The pure component spectra can thus be used to elucidate the chemical composition of the paints in terms of inorganic pigments and additives, while the pure component distribution maps can be used to visualize the different paints and paint layers independently, and thus deconstruct the artist process. This combined MA-XRF/MCR-ALS method was recently used to study Mondrian’s palette and technique in Broadway Boogie Woogie  and a similar approach but with a slightly different mixture decomposition algorithm [Non-negative Matrix Factorization (NMF)] was used to discriminate and map cobalt based pigments in a Rembrandt painting  and to identify an anachronistic pigment in forgeries of historical enamels . In this paper, we report on how MCR-ALS was used to successfully decompose the MA-XRF data for Number 1A, 1948 and extract a set of pure components that were then visually matched to the paints used by Pollock. The distribution maps of these paints were used to virtually reconstruct the artist process and the chemical information contained in the paints signature spectra was used to elucidate their composition and identify the pigments, fillers and additives. The results of the MA-XRF/MCR-ALS approach were complemented by in situ XRF spot analysis with a handheld instrument and compared to the analysis done in the past using polarized light microscopy (PLM), Scanning electron microscopy with X-ray microanalysis (SEM–EDS) and Gas chromatography coupled to mass spectrometry (GC-MS) [3, 26, 27]. MA-XRF scanning was carried out with the M6 Jetstream from Bruker AXS. The instrument has a 30 W rhodium target microfocus X-ray tube with a maximum voltage of 50 keV and a maximum current of 0.6 mA and a silicon drift detector (SDD). Details on the setup can be obtained elsewhere . XRF mapping was performed over four different areas where partial handprints seemed to appear through the heavy layering of paints (Fig. 1). The scans were acquired with a 0.6 mm spatial resolution and a dwell time of 90 ms/pixel. Tube settings were 40 kV and 0.5 mA. The Bruker instrument software package was used to acquire the data and to identify the elements detected in each scan by examining the overall spectral summation and the maximum pixel intensity spectra . It was also used for a preliminary evaluation of the corresponding elemental distribution maps. The in situ XRF spot analysis was carried out with a Bruker Tracer III-SDD handheld XRF instrument with a rhodium tube and a silicon drift detector (SDD). A helium purge was used to improve the sensitivity for low Z elements such as Mg, Al and Si which are not easily detected by MA-XRF. The instrument was operated at 40 kV and 3 µA; spectra were acquired for 120 s. The analysis was restricted to areas where the paints were not mixed or layered and spectra were acquired on three different spots for each of the paints identified visually. MCR-ALS was used to resolve the MA-XRF data cube and was carried using the SOLO + MIA software from Eigenvector Research Inc (version 8.1.1). The M6 Jetstream raw files were imported using the Lispix Raw formatted image importer (LISPIXRAWREADR). The depth dimension of the original spectral data cube was compressed to the 1–18 keV range and a 50 eV spectral resolution (335 variables in total). The data was Poisson scaled before the analysis  to enhance the signal and thus contribution of the elements that are less prevalent or to which the instrument is less sensitive. The three dimensional (x, y, Energy) XRF data cubes (covering two spatial dimensions x and y, and the energy or spectral dimension) was first flattened into two-dimensional (p, Energy) data matrices where each pixel p is characterized by a spectral distribution. MCR-ALS is a bilinear factor decomposition method solved by means of alternating least squares optimization . The model can be described in linear algebra terms by D = CS T + E, where D is the experimental matrix that contains the spectra of all the pixels in the image; S T (spectra) and C (concentrations) are the factor matrices obtained by the bilinear decomposition corresponding respectively to the spectral signatures and the related concentration profiles or distribution maps of the pure components extracted; E refers to the non modelled noise/error/residual contributions matrix. MCR-ALS is an iterative method that requires both the input of the number of pure components and an initial estimate of their spectral signature. The number of components may be known beforehand based on the knowledge of the system. In this particular study, the a priori knowledge of the number of paints can be supported by visual examination of the painting though it implies that paints are always distinguishable which may not be the case if paints have the same color but a different composition, or if a paint layer is covered with another layer. The number of components can also be estimated from the eigenvalues analysis of the data matrix using for example principal component analysis (PCA)  or singular value decomposition (SVD) . In any case, especially when in doubt, MCR-ALS models with different sizes can be tested. Each added component must clearly increase the explained variance in the data and lead to a model with interpretable signature spectra and concentration profiles. Reference spectra, on the other hand, can be used as the initial estimates of spectral signatures if available but this is not always feasible or realistic for paintings with historical, heterogeneous, layered materials. Alternatively, the initial estimates can be extracted directly from the data using purity based methods. These methods can be either interactive, like simple-to-use interactive self-modelling mixture analysis (SIMPLISMA)  or automatic and based on the identification of the more extreme sample points in the data matrix . This last method is based on the observation that the true spectra must lie on the exterior of the data space and that the measured spectra at the extremes of the data space provide a useful first estimate. This assumption is reasonable in the particular case of this painting, on the one hand because some areas of the raw canvas remained uncovered and thus its contribution can be extracted as a pure component. On the other hand, the artist applied the paints mostly straight out of the tube or the can and did not mix them; therefore it should be possible to extract pure components for each of them as well. The algorithm used for this study (EXTERIORPTS in SOLO + MIA) uses the extremes of the mean-centered one-norm data as initial guesses based on a user defined threshold for the minimum norm value (a low threshold was used in this study to guarantee that contributions for low Z elements and paints used marginally would be extracted). MCR-ALS analysis will converge to different sets of concentrations and spectral profiles that equality fit the data . This ambiguity is usually suppressed or decreased by introducing certain constraints and by evaluating the results with a priori knowledge or complimentary information (in this study we used the results of XRF spot analysis to evaluate the MCR-ALS components). Non-negative constraints for both concentration profiles and spectral signatures were applied in this study using the FASTNNLS algorithm . Contrast enhancement, on the other hand, provides profiles which are as orthogonal as possible within the bounds of the other imposed constraints and without significantly increasing the model lack-of-fit . Contrast enhancement can be used in two extreme modes, to either enhance differences between the resolved distribution maps or to enhance differences between the resolved spectra. 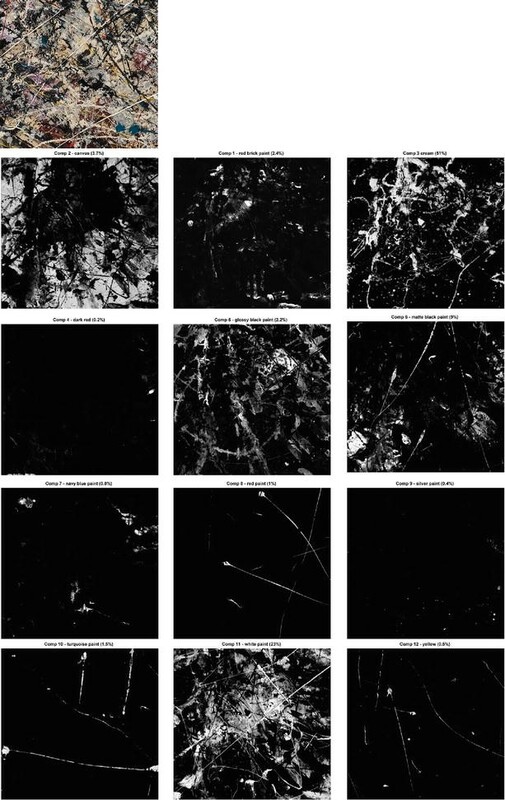 Both methods were evaluated but spectral contrast enhancement tended to extract components as individual elements which is of limited interest as this information can be obtained by other methods . The concentration contrast enhancement on the other hand extracts components as combination of elements representative of pigments or individual paints which is the innovative aspect and interest of the MCR-ALS approach. Based on the MA-XRF hyperspectral data of the four areas scanned, a total of twenty chemical elements were identified: P, S, K, Ca, Ti, Cr, Mn, Fe, Co, Zn, Se, Sr, Zr, Mo, Nb, Cd, Sb, Ba, W and Pb. All these elements were confirmed by handheld XRF analyses that also detected the presence of Al and Si. MCR-ALS analysis was used to evidence how these elements are combined together in the different paints and in the form of pigments, fillers and additives. The analysis was carried out in two steps. The objective of the first step was to obtain a signature spectrum for every single paint identified visually. A sequential MCR-ALS approach was used instead of imposing a number of initial pure components based solely on the number of paints identified visually. For each scanned area, a model was initially fitted with a number of components based on a PCA exploratory analysis, and using the automatic purest variable detection algorithm to obtain the pure spectra initial estimates. An additional factor was then added to the initial solution and the model was fitted again. This process was repeated until a satisfying number of components was reached. The main criteria for the quality assessment of the MCR-ALS final model was the total variance explained (around 95 %) and interpretability of both distribution maps and spectra supported by the side by side comparison of the distribution maps and image of the painting under normal light, UV light, and existing knowledge on pigments [37–39] as well as composition of modern paints [19–21]. Some of the paints were used more sparingly by Pollock while other paints have a weaker XRF contribution and are thus more difficult to extract in every scanned area. Ultimately, the number of components identified and mapped varied between eight and ten depending on the scanned area. In total, twelve different components were identified and visually matched to eleven paints, namely matte and glossy black, white, cream, yellow, red, dark red, brick red, navy blue, turquoise, silver gray and to the canvas. The corresponding signature spectra were consistent across the four scanned areas. They were also evaluated and compared to complimentary spectra acquired by XRF spot analysis using the handheld instrument to confirm the elements identified for the different paints. This set of twelve initial estimates was then used as pure component input spectra in the second step of the MCR analysis to refit the four scanned areas and using hard equality constraints . This way, some of the paints that had not been extracted and thus mapped during the first step of the MCR-ALS analysis emerged during the second step, even if they had a very weak XRF signal or were present in only a few drips or brushstrokes. The results presented in Figs. 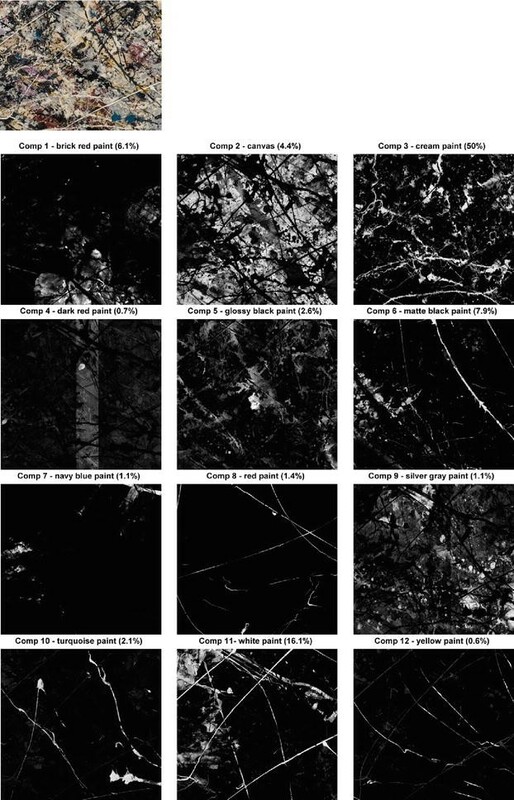 2, 3, 4 correspond to the distribution maps and signature spectra of the eleven paints and canvas identified using the MCR approach for two of the four scanned areas of the painting. The highlights in the map correspond to areas where the paint is present. Upon visualizing the paints individually, a pictorial logic emerges from the seemingly chaotic composition. The XRF mapping exposes passages that have been covered with other paints and reveals the unbroken gestures of the artist and the intrinsic differences in flow between commercial and artist’s paints. The distribution maps can also be overlapped to virtually reconstruct the painting and help establish the sequence in which the paints were applied. Figure 5 shows for example that Pollock used the white paint in two passages; at first in short wide brushstrokes and possibly the end of a stick, and later on in long thin lines, but after he applied the red and then yellow paints. The same exercise can be extended to the eleven paints. The sequence was the same for the four scanned areas: brick red, matte black, navy blue, white, cream, glossy black, silver, red, turquoise, yellow, dark red, white again and matte black last, suggesting Pollock worked in successive passages across the entire painting. He did on occasion mix some of the paints to produce for example purple and gray colors. Figure 6 shows that the gray brushstrokes were made by mixing the white paint with the glossy black paint and not with the matte black paint that he used in the adjacent brushstrokes. Most of the time however he applied each paint straight out of the tube or can, sometimes after perforating them, and with a specific gesture, brushstroke (matte black and white), dripping (cream, glossy black and silver gray), thrusting (turquoise, matte black and white), squeezing the tube (red and yellow) or splattering (cream and silver gray), and using a specific tool, brush or stick [41, 42]. Some of the paints were applied wet on wet like the thinner cream and glossy black house paints creating the marbling look illustrated in Fig. 7 by overlapping the corresponding distribution maps for the area (3). He used his hands to apply the red brick and matte black paints leaving clear handprints, or creating large stains by dragging his hands or pressing his palms against the canvas. The handprints in black appear to be limited to the edges of the painting, in particular at the top right, while the handprints revealed by MA-XRF are painted in brick red and mostly on the left side of the painting (Fig. 8). It would be interesting to carry out a full scanning of the painting and other Pollock paintings to better understand the role of the hand prints in the overall composition. These are just a few examples to illustrate what can be learned about the artist’s process by visualizing the paint layers individually or by combining and overlapping them to evidence Pollock’s gestures and process. Three of the paints, the glossy black, the cream and the silver gray have been identified in the past as being commercial paints with different media (oleo-resinous, oil modified alkyd and linseed oil respectively) and the remaining paints, matte black, brick red, bright red, turquoise, bright yellow and white are expected to be artist oil paints [3, 26, 27]. Based on the elements identified in the signature spectra (Fig. 4) and XRF spot analysis, a tentative list of inorganic pigments and fillers is proposed below for each paint. Further analysis is underway with complimentary techniques, both noninvasive, namely hyperspectral visible near infrared (Vis-NIR) and Total Reflection Fourier Transform Infrared Spectroscopy (TR-FTIR) as well as invasive, including gas chromatography with mass spectrometry (GC-MS), FTIR and Raman spectroscopies, to confirm and complement the materials characterization. Pollock chose an unprimed cotton duck canvas for this painting that he may have sized with a proteinaceous glue . Based on the signature spectrum and XRF handheld analysis, the main elements present are S, K and Ca, and other elements in smaller concentration are Al, Si, P, Cl, Ba/Ti (these two elements are often difficult to distinguish because of overlapping characteristic lines ) and Zr. Most of these elements have been identified by XRF spot analysis in samples of unprimed duck canvas from different contemporary manufacturers (results not shown). The remaining elements may have been introduced during previous conservation treatments or with the glue sizing. This was one of the few paintings that suffered from soot deposition after the 1958 fire at MoMA . It was cleaned at the time with Soilax, a commercial cleaning product containing trisodium phosphate to remove the grime, and a solution of Chloramine-T, a biocide and mild disinfectant used as bleaching agent and containing N-chlorinated and N-deprotonated sulfonamide, to level the stains in the canvas . These products are known to leave residues on the surface and it should be noted that these cleaning agents are no longer used by conservators [45, 46]. The canvas has also been retouched in areas with persistent discoloration during a more recent conservation treatment . The analysis done in the past [3, 26, 27] indicates it is an artist oil paint containing bone black and a small amount of calcite filler. The main elements identified in the MCR-ALS signature spectrum and confirmed by handheld XRF are P and Ca as well as smaller amounts of S, K, Ba, Mn, Fe, Zn, Sr and possibly Zr. The presence of Ca and P confirms the presence of bone black (contains usually about 15–20 % carbon, 60 % calcium phosphate, 20 % calcium sulfate and impurities ). Calcite may be present as filler but its presence is impossible to discern by XRF from the aforementioned calcium phosphate. The K, Mn and Fe could be due to the presence of umber, a natural brown earth pigment containing iron and manganese oxides . Zr is often present as a paint drier . The combination of S, Ba and Sr is usually associated with barium sulfate as filler (Sr is an impurity stemming from its raw material barite ) or lithopone, since Zn is also present (filler composed of a mixture of zinc sulfide (30 %) and barium sulfate (70 %) with trace amounts of zinc oxide ). The major element identified in the signature spectrum is W and other elements present are P, S, K, Ca, Ba, Fe, Zr and Mo. A significant amount of Al was identified as well by handheld XRF. The presence of P, W and Mo suggest the presence of a dye salt with a complex anion derived from the phospho-tungsto-molybdic acid (PTM). The paint has a strong pink-red fluorescence under ultra-violet light suggesting it might be the rhodamine based Pigment Red 81:1 . This pigment is usually bluish red, but it is known to darken noticeably when exposed to light. It would be important, for the purpose of preventive conservation, to confirm the identity of this red pigment by a complimentary technique such as FTIR and by taking a cross section to determine if the paint has darkened at the surface. The other elements are present as minor ingredients such as filler (barium sulfate and calcite), drier (Zr) and impurities and/or other additives. Further analysis is needed to identify the source of Al since the signal obtained by handheld XRF indicates it is a major ingredient like for example a lake pigment. Pollock made a limited use of this paint, at least in the areas that were scanned. The main elements identified in the signature spectrum are Ba, Cr, Mn, Co and Zn, and minor elements area P, S, Ca, Fe, Pb and Sr. XRF spot analysis also detected a high level of Al. The variety of elements suggests a potential mixture of pigments and possibly fillers. Pinpointing their exact nature necessitates additional analysis on samples. The presence of S, Ba, Sr and Zn could indicate the presence of barium sulfate and zinc white or lithopone. The coinciding presence of Mn and Ba, S and Sr however could suggest the presence of manganese blue (BaMnO4-BaSO4), a blue green pigment manufactured between the mid-1930s and early 1990s [54, 55]. The presence of Al and Co could also indicate the presence of cobalt blue  but some variations of this pigment contain Zn or Cr like for instance blue green cobalt chromite, aka blue green Spinel Pigment Blue 36 (Co(Al,Cr)2O4)  and zinc cobalt chrome aluminum Spinel Pigment Blue 36:1  which could account for the presence of Cr, Zn. Pb may be present as a drier . Other elements may be present as fillers and/or minor pigments or impurities. The main elements present in the white paint are Ba, Ti and Zn, together with smaller amounts of P, S, Ca, Sr and Nb. As mentioned above, it is not always easy to detect the presence of Ti in the presence of Ba but when in sufficient concentration, it will cause a small positive shift of both the BaLα1 and BaLβ1 lines due to the overlap of the Ti Kα and Kβ lines as well as an unexpected BaLα1/Lβ2 ratio . The Ba lines shift is observed in the signature spectrum and spot analysis spectra taken on the white paint indicating that both elements are present. Based on the analyses carried out in the past by SEM–EDS , this paint contains a titanium white/barium sulfate composite white pigment and possibly lithopone. The high Zn to Ba ratio indicates that Zn is also present as zinc white and not just lithopone. Nb is a known impurity that remains in the titanium white pigment produced by the sulfate process  (the chloride process was introduced later, in the late 1950s, and removes the Nb from the ilmenite more efficiently). P may be present as a pigment coating . Based on the signature spectrum, the main elements present in the paint are Mn, Fe, Co, Zn and Pb, and minor elements are S, Ca, Ba/Ti, Sr and Zr. XRF spot analysis identifies also the presence of Al and Si. The presence of the metallic elements suggests the presence of a mixed metal oxide pigment . The presence of Ba, Ti, Sr and Zn may be due to the presence of filler but may also be related to the presence of the cream paint that the glossy black is intimately mixed with (the paint were applied wet on wet). Pb and Zr may be present as driers (combination of driers are common in paints ). Analysis in the past however by PLM and GC-MS [3, 26] indicated the glossy black paint is a commercial carbon-based paint (C cannot be detected by XRF) with S and small amounts of Si, K, Ca, Ti and Fe. It is possible that Pollock used two glossy black paints and that the one identified in the past is not mapped because the carbon based pigment is not detected by XRF and the concentration of the other elements it too low for the paint to be extracted as a pure component. The main elements identified in the corresponding signature spectrum are Ti and Zn, and other elements are P, S, K, Cr, Mn, Fe, Co, Pb, Sr, Zr, Sb and Nb. Al and Si were identified by handheld XRF. The high level of Ti and Zn suggest it is a titanium white/zinc white based paint. Sb2O3 can be found in titanium white paints manufactured in the United States in the 1940s and was added during the calcination step of the sulfate process to produce the anatase pigment (anatase based paints often have a cream color) . Other elements are associated with the presence of fillers, additives or pigment coatings (aluminum silicate coatings were patented in 1942 for example ). The metallic elements are present in very low concentration and may be related to the glossy black paint that was poured on wet on wet. Cr might indicate the presence of a small amount of a chromium based pigment (chrome yellow could explained the light cream color as well). Based on the spectral signature and confirmed by XRF spot analysis, this paint contains Al (the signal is weak in mapping mode but strong using the handheld instrument with He purge) and Fe. Also present are Ca, Ba/Ti, Cr, Mn, Co and Zr. Analysis in the past determined it is a commercial paint and that the color is due to the presence of aluminum . An aluminum flake based commercial paint has been identified in Pollock’s Number 10, 1949 . Mn, Co and Zr could be co-driers. Further analysis is needed to identify the source of Fe. Based on the signature spectra, the main elements in the yellow paint are S, Cd, Ba, Zn and Sr. The red paint contains the same elements as well as Se. Both paints contain also small amounts of P, Fe and Sr. The main elements could indicate the presence of cadmopones which are co-precipitates of cadmium sulfide (yellow) and/or cadmium sulfo-selenide (red) with barium sulfate and/or zinc sulfide, but they could also indicate the presence of pure cadmium yellow and cadmium red, with barium sulfate and zinc sulfide (lithopone) and or zinc white. Cadmopones were introduced in the mid-1920s in the United States as a less costly alternative to the pure cadmium pigments [55, 59]. The signature spectrum indicates the presence Ba and Mn as main elements, as well as S, K, Ca, Co, Pb and Sr. Al was identified as well by handheld XRF. The presence of Ba and Mn suggest the presence of manganese blue, Pigment Blue 33 (BaMnO4.BaSO4). The other elements are potentially due to the presence of fillers (Al, K and Ca) and driers (Co, Pb) unless a small amount of cobalt blue is also present. Based on the signature spectrum, the major element present is Ca suggesting the color is due to the presence of an organic pigment (Ca may be due to the presence of paint filler, a substrate or cation for the organic pigment). Other elements present in small amounts are P, S, Fe and Sr. This paint seems to have developed a dark skin that makes it appear almost black. Sampling is needed to identify the organic pigment by FTIR and determined if discoloration has occurred. This study shows that a MCR-ALS approach can be used to process the MA-XRF mapping data, especially for modern works of art that were executed with paints that have a complex composition. MCR-ALS was able to un-mix the hyperspectral data and extract and map a set of pure components that could be matched directly to eleven different paints used by Pollock and the canvas. The pure components signature spectra were used to identify the elements present in the paints providing clues about pigments and fillers in a noninvasive way. The algorithm was also able to extract the smaller contributions for example of the impurities in the paints which can inform on the manufacturing process of a pigment, and possibly of the driers and other additives such as pigment coatings, and to extract and map the paints that were only used marginally. Further analysis with complimentary techniques is now needed to fully characterize the paints and confirm the identity of the pigments namely bone black and umber (matte black paint), Rhodamine 6G/PR81:1 (brick red paint), Cobalt blue or variations, PB36 or PB36:1 (navy blue paint), barium/titanium white composite pigment and zinc white (white paint), metal mixed oxides black (glossy black paint), titanium white and zinc white (cream paint), aluminum/iron metallic paint (silver gray paint), cadmium yellow and cadmium red or cadmopones (yellow and red paints), manganese blue/PB33 (turquoise paint), and help identify any organic pigments not detected by XRF, in particular those in the second glossy black paint and the dark red paint. Pollock’s intricate composition is the perfect example to demonstrate the value of visualizing the paints separately to evidence, reconstruct and better understand the artist process and single out each of his gestures and how the paint responded. AM, GVDS, BVD, JD and DD contributed to the conception of the study and acquisition and analysis of the data. These authors as well as JC, CMG and KJ were involved in the interpretation of the results and drafting/revising the manuscript. All authors read and approved the final manuscript. A. Martins is grateful to Helen Harrison from the Pollock-Krasner Foundation for helpful discussion on the materials used by Pollock, to the colleagues in the MoMA conservation department (Cindy Albertson, Jennifer Hickey and Anny Aviram) for their support during the XRF mapping and valuable comments and to Eigenvector Research Inc, Manson. This research was supported by the Baillet Latour fund (Brussels) and by BOF-GOA project “SOLARPaint” of the University of Antwerp Research Council. Meyers D. The color of art site map—Pigments, Paints and Formulas; 2013. http://www.artiscreation.com. Accessed May 2016. CAMEO: The conservation and art materials encyclopedia online, Museum of Fine Arts, Boston. http://cameo.mfa.org. Accessed May 2016. Comment, The New Yorker, April 26, 1958. p. 23, http://www.newyorker.com/magazine/1958/04/26/comment-4537. Accessed June 2016. Coddington J, Hickey J. MoMA’s Jackson Pollock Conservation project: bringing the project to conclusion: restoration of Number 1A, 1948, Inside/Out, a MoMA-PS1 Blog. New York: The Museum of Modern Art. https://moma.org/explore/inside_out/2014/01/13/momas-jackson-pollock-conservation-project-bringing-the-project-to-conclusion-restoration-of-number-1a-1948. Accessed Jun 2016.